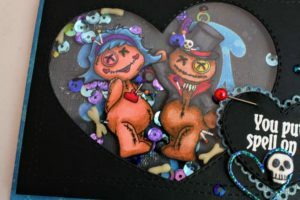 Have you seen the new Voodoo You Love stamp set from Witt & Sass yet? I’m totally smitten!!! You guys, I was lucky enough to win this set and I couldn’t be happier! It was love at first sight when I saw it and I planned on buying it as soon as it was officially released, but I won it instead (leaving me enough extra dough to buy another set on my wish list)! Woohoo!!! I immediately stamped out all of the images a few times and colored them in. The sweet cheeks on the girl doll reminds me of one of my crafty heroes, Rita Barakat, so I just had to give her blue hair too. I used a silver pen, Wink of Stella, and Glossy Accents to give certain areas more shine. 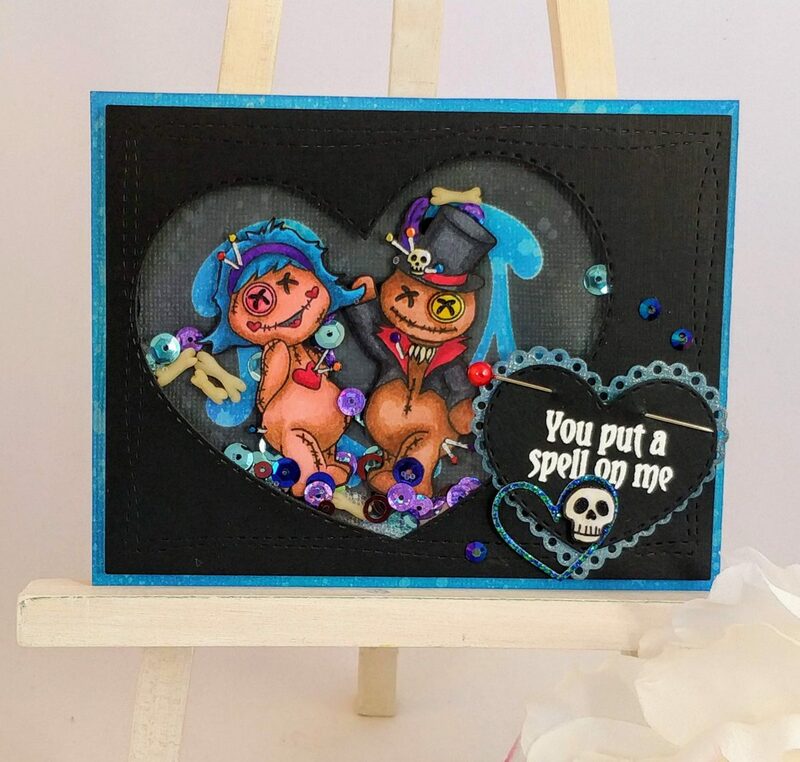 The new Sassy Packs were also on my must have list and I was inspired to create a shaker card using the Boo-licious pack. Now don’t get me wrong, the Boo-licious pack has an awesome selection of shaker bits, but I really wanted to add some bones to the mix. When I broke out the ivory Sculpey, my husband was intrigued and wanted to play too. We sat at the table and made clay bones all night. It was a blast and I have more leftover for other projects! (Side note, I’m a really lucky lady! #couplegoals) After they baked and cooled, I distressed them with a little walnut ink. To assemble my card, I inked up a background with blue and black Distress Oxide inks and die cut masks. I used a think layer of foam tape to pop up my dolls, then piled my custom mix of shaker bits on top. I used a wonky stitch rectangle die and a large stitched heart die to cut my window frame from black cardstock. I backed it with acetate and a double layer of foam tape before adhering it to my background. For my sentiment, I layered several heart dies and used white embossing powder to heat set the words. I stuck a large pearl-head corsage pin through the black heart to mimic the pins in the dolls. 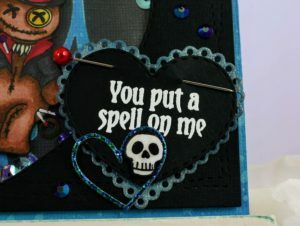 Foam tape attaches the sentiment to the card front and also pops up the tiny skull. 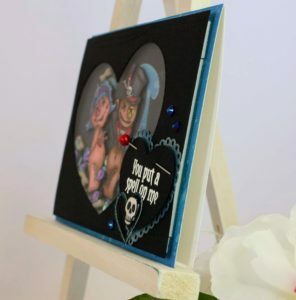 To finish off my card, I added a few blue/black flat-backed crystals from the Boo-licious pack near my sentiment. What do you think? Has this new stamp set cast it’s spell on you yet? Stay tuned for more projects from me featuring this cute couple; they’re just too cute!